September 4, 2011 - As the 10th anniversary of September 11th approaches, the world’s largest Flight Attendant union, the Association of Flight Attendants-CWA (AFA), reminds the public that the story of 9/11 cannot be told without recognizing the Flight Attendant heroes and the role they played as first responders. At the same time, AFA is focused on providing members with support, resources and a forum for remembering their flying partners who perished in the line of duty and for relating their own experiences. The September 11 attacks (called September 11, September 11th or 9/11), were a series of four coordinated suicide attacks by al-Qaeda on the United States on Tuesday, September 11, 2001. On that morning, 19 al-Qaeda terrorists hijacked four passenger jets. The hijackers intentionally crashed two planes into the Twin Towers of the World Trade Center in New York City, killing everyone on board and thousands of those working in the buildings. 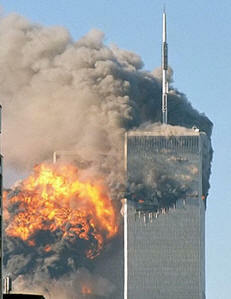 Both towers collapsed within two hours, destroying nearby buildings and damaging others. A third plane was crashed into the Pentagon in Arlington, Virginia. Hijackers had redirected the fourth plane toward Washington, D.C., targeting either the Capitol Building or the White House, but crashed it in a field near Shanksville, Pennsylvania after passengers tried to take control of the plane. Nearly 3,000 victims and all the 19 hijackers died in the attacks. Among the 2,753 victims who died in the World Trade Center were 343 firefighters and 60 police officers from New York City and the Port Authority, and 8 private emergency medical technicians and paramedics. Another 184 people were killed in the attack on the Pentagon. There were no survivors from any of the flights and the overwhelming majority of casualties were civilians, including nationals of over 70 countries. “Our twenty-five Flight Attendant heroes on those four fateful flights acted as first responders. They relayed the first intelligence of the day that served to alert our country and our fellow crewmembers on flight 93 who in turn acted without reservation against evil, sacrificing their own lives to protect the lives of countless others. September 11th showcased the tremendous bravery of Flight Attendants,” said AFA International President Veda Shook. Earlier this month the union launched an on-line memorial to the honor the 25 crewmembers who were among the first to alert the world to danger and courageously fought back on September 11, 2001. AFA’s memorial Never Forget may be viewed. On each anniversary, the union encourages Flight Attendants to mark the day in the way that’s best for them – whether that means honoring our heroes by working a flight, attending a memorial or observing a quiet reflection among family and friends. It can be a difficult day for Flight Attendants as images and stories from that fateful day are replayed and renewed. This year it will be especially challenging to personally choose how to remember as media attention promises to be intense. For Flight Attendants, the anniversary is important for the world to remember, but the events of September 11th are present with them every flight. “Every day since September 11th, Flight Attendants go to work with an even greater sense of responsibility. We know that not only are we first responders to emergencies affecting the health and safety of our passengers and other crewmembers, we are also the last line of defense in aviation security,” stated Shook. “Nearly ten years ago on September 11, 2001, we lost our flying partners and our profession changed forever. We promised to Never Forget our heroes who were first responders in the sky. We promised to Never Forget the events of that day and to ensure they never happen again. Our heroes will forever unite us,” said Shook. The Association of Flight Attendants is the world’s largest Flight Attendant union. Focused 100 percent on Flight Attendant issues, AFA has been the leader in advancing the Flight Attendant profession for over 65 years. Nearly 60,000 Flight Attendants at 23 airlines come together to form AFA, part of the 700,000-member strong Communications Workers of America (CWA), AFL-CIO.